Recognition is one of the most influential factors in motivation. Recognition leads to increased effort and in turn, better performance. NITI Aayog’s Pitch to Move is Government of India’s push to encourage and facilitate entrepreneurs in the sector of transportation. The aim of this competition is to provide opportunity to young entrepreneurs in the field of mobility to pitch their ideas to eminent Jury and Venture Capitalists. This platform seeks to set a stage where innovation and unique business models find applicability, practicality as well as realizability. The winners were felicitated by the Prime Minister himself during the MOVE: The Global Mobility Summit 2018. 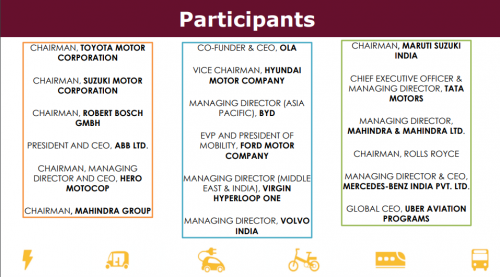 The Global Mobility Summit has brought together stakeholders from across various sectors of mobility like OEMs (Original Equipment Manufacturers), Battery Manufacturers, Charging Infrastructure Providers, Technology Solution Providers to share their insights on revolutionizing transport. This has been the perfect stage where budding entrepreneurs have presented their novel ideas for innovation in the field of mobility; the ultimate goal being cleaner and efficient transportation systems. The domains of Public Mobility, Electric Vehicles, Shared Transport, Last Mile Connectivity, Passenger Transportation, Battery Technology, Automotive IoT (Internet of Things), Freight & Logistics, Powertrain/Drivetrain, Experiential, Travel, Mobility Infrastructure and Automotive Electronics etc, were invited to submit their applications and the selected start-ups got the opportunity to showcase their business ideas to the jury during the Global Mobility Summit. The final round featured 32 start-ups across various mobility fields. 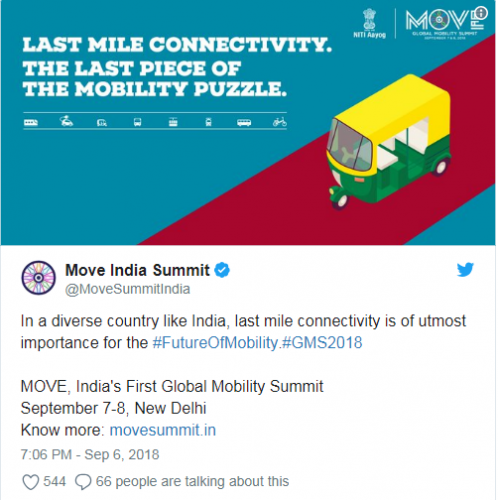 Final results were announced during MOVE: The Global Mobility Summit, on 7th and 8th of September, 2018. The intention of the Government has been to realize its vision of Shared, Connected, Intermodal and Environment Friendly Mobility for India. [Press Information Bureau, Government of India, NITI Aayog, 14-August-2018 14:21 IST] The objective is to harness the latest disruption for generating employment, enhance the ease of living for citizens in India and growth in the country. The Government further highlights the importance of mobility as a potential driver for innovation, job creation, economic growth and social change.